Pembroke's Andy Balbirnie in action against Waringstown in the semi-finals of the Irish Senior Cup in 2017. 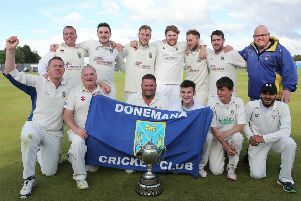 Cricket Ireland has completed the draw for the Quarter Finals of both the Clear Currency Irish Senior Cup and Clear Currency National Cup. The draw was undertaken by Mr Paul Reilly from Clear Treasury and Dennis Cousins, Commercial Director for Cricket Ireland. The Quarter Final draw for the Clear Currency Irish Senior Cup relates to matches to be played on Sunday 15 July 2018 (replays Sunday 22 July 2018). The Quarter Final draw for the Clear Currency National Cup relate to matches to be played on Sunday 15 July 2018 (replays Sunday 22 July 2018). The draw for the next stage of both cup competitions will be held the week commencing 23 July 2018 (as always, exact timing of the draw is influenced by the return of the match scorecards).